The Hangar was created and assigned to preserve life. The Hangar was erected with the voices of the perished children to bring the message of life entrusted to us to both the living and the dead. It is the sounding board of the journey of voices, the deep-seated heart in the desert. A place of silence, truth and listening. A house of mercy. The Hangar is the heart. Located in the wilderness, at the edge of the Judean Desert, on the road leading to the Dead Sea, in Arad's Industrial Zone, the Hangar creates a timeless, place-less territory. The vast emptiness of the desert makes it akin to a child born out of the living heart. The Hangar is a lighthouse, a landmark, and a hidden inner spring which nourished both the living and the dead, granting hope, solace, faith in life, and happiness. The installation, the poems, the paintings, the film and sound fuse to create a single universe, conveying the children's cry and the mothers' mourning. 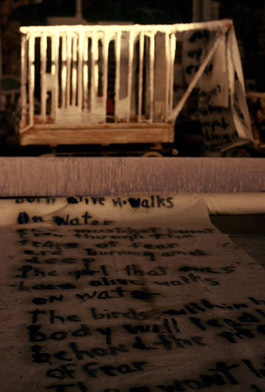 The installation comprises poems handwritten in paint on white sheets of fabric like ancient manuscripts by monks or copyists of the Scriptures, Holy Ark curtains, and stained bed sheets. It incorporates bandaged childhood objects and blankets of salt, deathbeds moving between hospitals, chamber tombs. It creates a boundless territory between the Land of the Dead and the Land of the Living, also spanning their interstices and transitional stations. The installation constructs a bridge between the worlds of the living and the dead; a bridge marked with drops of blood. It is a journey to the Land of the Living; toward resuscitation of the souls. The poems, paintings, voice and image enrich and reinforce one another, creating a sounding board for the burnt, silent voices; for the bleeding pages of history. The blood of the wounded transforms into the blood of life, stitching the rifts, healing, and granting a new life. The essence of the place is a journey into the Land of the Living. The shattered woman held onto her dead body and her shattered life. Born from the blood stain, she was healed, soaring on her illuminated soul, fusing with the light, transforming into a sounding board, into a suitcase filled with bleeding pages of history; echoing voices, the mothers' laments and the sounds of long gone children. The place, the time, frozen and uprooted, a place of eternity, a station between the worlds of the living and the dead, a place of maternity whose dead children call upon, whose living children call upon. A territory of white oblivion, frozen signs of life, a bandaged rocking horse and a bruised chair, blankets of salt and maternal tears. The cry of yearning is inscribed in blue marks like signs on stained sheets, a Holy Ark curtain, and tomb demarcations. From the locus of profound death, the blue child is born in salt, engulfed by life and hope in vessels of water and baptism on a journey to the Land of the Living through the Sea of Death in the interstices between worlds. Existence is the memory, The long gone children are all of us.